Printed By: American Bank Note Co. 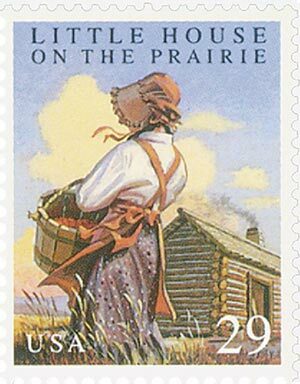 Inspired by her childhood travels through the undeveloped frontier of the Midwest, Laura Ingalls Wilder’s series known as the “Little House” books, has been praised as a vivid literary saga of 19th century life on the plains. Born in 1867 in Pepin, Wisconsin, Wilder traveled with her family by covered wagon through Kansas, Minnesota, and the Dakota Territory, where she met and married Almanzo Wilder. Although there was deprivation and hard work, there were also many happy times of love and laughter, all of which is captured in her endearing classics. An editor for 12 years for the Missouri Ruralist, Wilder began recording her childhood experiences at the urging of her daughter. Published in 1935, Little House on the Prairie followed her first book, Little House in the Big Woods. Seven other books later became part of the series. Received warmly by the public, the popularity of her books was boosted by the success of the television series, which first aired in 1974.